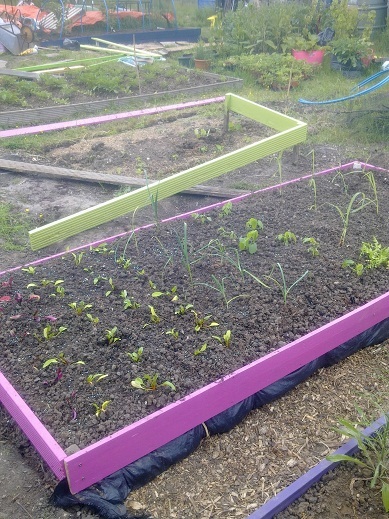 The Barbie bed has been filled, manured, and planted with sweetcorn, garlic, beans and beetroot. In today’s cold they all look quite depressed to be there, but the balcony looks a lot less crowded! I’ve staked my balcony garlic, which had decided to lie down, though it’s nowhere near ready. The boards for the next bed have been thoroughly greenified ready for putting in place when this week’s woodchip delivery happens. PS I had my first strawberry today – delicious!